A high strength tablet with guaranteed levels of catechins. 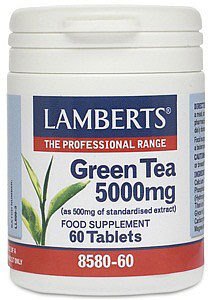 The green tea extract used in this Lamberts® product has been concentrated to ensure a high level of the active ingredients called catechins, providing 250mg per tablet. For Lamberts® to ensure the very best quality, and a high level of active ingredients, the extract is obtained from whole green tea leaves harvested young and without the leaves being fermented: (the process that turns green tea in to black tea). Just one of these tablets is equivalent to ½ litre of traditionally brewed green tea but with a caffeine content a fraction of normal tea. Green tea has become popular recently and is considered by some as a ‘superfood’ due to its high antioxidant activity. Calcium Carbonate, DiCalcium Phosphate, Cellulose, Tablet Coating (Hydroxypropyl Methylcellulose, Colours: Titanium Dioxide & Copper Chlorophyllin, Glycerin), Crosslinked Sodium Carboxymethylcellulose, Silicon Dioxide, Magnesium Stearate, Stearic Acid. The following list of allergens are excluded: Wheat, Gluten, Barley, Soya, Eggs, Milk and milk products, Lactose, Nuts, Sulphites, Celery, Fish, Shellfish and Yeast. Click Ask An Expert, our instore specialists will reply to your question by the end of the following working day or sooner if possible.